For me, the shopping season always begins with the Net-A-Porter sale. It is typically on Cyber Monday but they were sneaky last year and did it a couple of days before Thanksgiving. 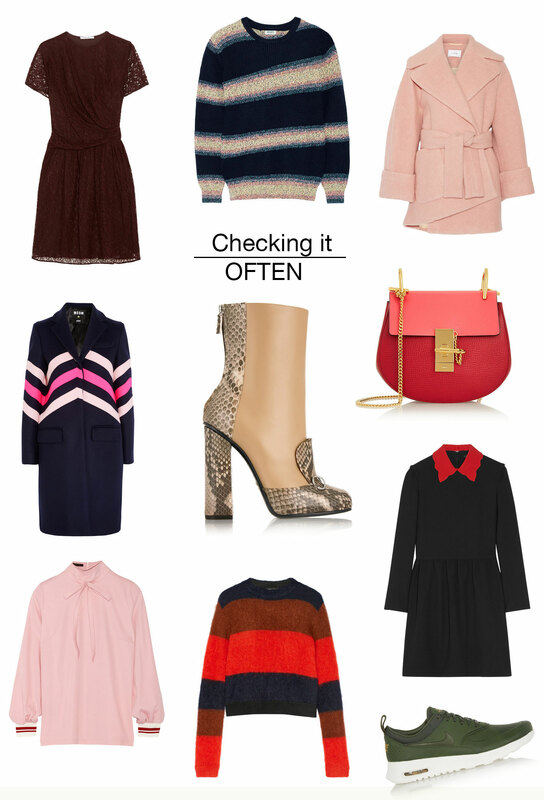 Here, a slew of items I have my eye on, plus the five top things I’m looking for this sales season. Certain items can go very quickly, so I always try to make a list of what I’m looking for ahead of time. It’s a good idea to add any items you may be interested in purchasing to your wish list right on the site, and then go straight to that page the second the sale hits. TIP: In all the years I have been shopping the sale, it always begins in the wee hours. I tend to use the Net-A-Porter sale for really dreamy pieces—wish list items I almost dare not add but I do anyway because YOU NEVER KNOW WHAT CAN HAPPEN. I have been able to nab such conversation pieces at 70 percent off the retail price in past years. 1. A printed coat. I certainly love my prints and I may have a bit of an obsession with outerwear, so this year I’m looking to marry the two in a winter coat. The Miu Miu coats are the total fantasy. I also love the MSGM coat with the quirky, colorful chevron print. 2. A prim dress. Valentino’s short and swingy A-line dresses with lacey Peter Pan collars are what my dress dreams are made of. I would love to get my hands on the Maje dress that looks very similar for a fraction of the price. 3. Calf-length boot. This length feels so fresh this season and Gucci’s neardy-cool aesthetic is bonkers. 4. Trippy sweaters. I’m looking for statement sweaters this season that make me feel cozy and cool. 5. More sneakers. I find myself wearing sneakers more and more now that I spend the bulk of my time running my daughter around to places, and I want to feel comfortable but still make a statement with my footwear. I love Stan Smith and Stella McCartney for Adidas, Liberty x Nike was a dream collaboration and right now I’m crushing on the Nike Air Max Thea sneakers. They’re almost so ugly they’re actually cute.